Many recordings on the Hallé’s own label are taken from live concerts but studio recordings are by no means unknown and this pairing of the Brahms piano concertos is a case in point. They feature the South Korean pianist, Sunwook Kim who was just approaching his 28th birthday when these performances were set down. Kim won the Leeds International Piano Competition in 2006 at the age of just 18, becoming the competition’s first Asian winner and one of the youngest pianists ever to lift the crown in Leeds. He’s already made a number of recordings, including the ‘Emperor’ Concerto with Myung-Whun Chung and at least three solo piano discs. This is my first opportunity to hear him. We read in Anthony Burton’s notes that shortly after these sessions Kim, Elder and the Hallé went on to perform both concertos in the same concert in Sheffield: that’s quite a feat of stamina, especially for the pianist. I don’t know if concert performances of either work had preceded the sessions but there seems to be an acute partnership between pianist and conductor. In concertos such as these, which are far more than virtuoso display vehicles and where orchestra and piano contribute in equal measure to the very serious musical argument, such an understanding is essential. It was quite interesting to hear this recording soon after the RCO Live version from Emmanuel Ax and Bernard Haitink (review). By comparison with that performance, given in the spacious acoustic of the Concertgebouw, the Hallé recording is more closely balanced. However, the balance isn’t too close and it means that you can hear plenty of orchestral detail in both concertos – and the Hallé, on collective excellent form, are well worth hearing. It’s worth saying also at this point that Kim’s piano is balanced nicely with the orchestra and the sound of his instrument has been well captured by engineer Steve Portnoi. In particular, the bass register, so important in these concertos, comes across splendidly. Elder ensures that the First Concerto has a big, arresting opening. 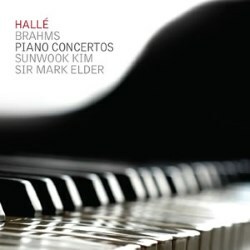 This is an imposing movement and even when Brahms relaxes somewhat the music still has a serious countenance Both Kim and the orchestra convey very successfully the turbulent passion of the writing and, equally, the passages of brooding introspection. Kim has all the necessary power in his fingers but I also like very much his legato playing. I made some comparisons with the classic 1972 Emil Gilels/Eugen Jochum account (review) and with Stephen Hough’s 2013 version in which he’s partnered by Mark Wigglesworth (review). The opening is more massive under Jochum, the Berlin Philharmonic’s timpanist producing thunderous rolls. Wigglesworth seems to inject slightly more urgency into the orchestral playing than Elder does. I think that Hough’s playing has just a bit more fantasy than I find in Kim’s admirable pianism. Gilels is simply Olympian in his approach, often more expansive than either of the other two pianists under discussion. And, my goodness, the sheer strength of his playing at times is amazing – yet he never forces the tone. It must be said, though, that his 45-year-old recording has to yield to the modern digital sound afforded to Hough and Kim; in particular Gilels’ piano can sound somewhat clangy, which I’m certain is not an accurate reflection of the way he voiced the music. Elder and his orchestra achieve a mellow opening to the Adagio. In this movement Kim’s playing has plenty of poetry and the orchestra matches him in expressiveness. Brahms admitted that this movement was “a tender portrait” of Clara Schuman. I think of the three Hough conveys the greatest tenderness, closely followed by Kim. Gilels seems to me to take a different approach to the music. He has a lofty, expansive view of the movement, which is clearly shared by Jochum; theirs is aristocratic music-making. Kim’s approach to the start of the finale is exciting and full of energy and those characteristics reappear several times. However, this is a Rondo with plenty of variety in its episodes and I think Kim is excellent in bringing out the variety. This movement is a long way from the dark turbulence of the opening movement, something which Kim and Elder bring out very well indeed. Hough isn’t quite as impulsive as Kim can be at times but his too is a highly enjoyable reading. Gilels is steadier than either but his performance is by no means lacking in dynamism. Overall, I think this Kim/Elder traversal of the First Concerto is a conspicuous success. How will they fare in the Second? The Second Concerto is on an even more epic scale than its predecessor. Not only does it too contain a very substantial first movement but also Brahms includes an additional movement, a quasi-scherzo. I was fascinated to read in the notes that Brahms explained the inclusion of the second movement by saying that the first movement was ‘too simple’ (or ‘innocuous’). He certainly set himself high standards! The Kim/Elder account of the spacious first movement is beautifully paced. You sit up and take notice from the very start because the Hallé’s playing of the long orchestral exposition is so distinguished. Kim’s playing is first rate: he combines muscularity and delicacy, according to the dictates of the music. After a very fine reading of the first movement there’s plenty of surging rhythmic drive in the Allegro appassionato. I enjoyed this performance very much. The Andante is one of Brahms’s loveliest inspirations. The Hallé’s principal cellist, Nicholas Trygstad gives an exemplary account of the opening cello solo and is no less appealing when the solo returns towards the movement’s end. His tone is rich and round, ideally suited to the music. Marcus Pouget, who plays on the Hough performance also gives great pleasure, though I have a slight preference for Trygstad’s sound. Emil Gilels’ cellist is Ottomar Borwitzky. He’s no less eloquent than either of his rivals but his tone is grainier, at least as recorded. Kim’s performance of the movement is extremely sensitive. At times, he plays with passion – is this yet another musical portrait of Clara, as Anthony Burton suggests? – but the primary impression he leaves concerns the delicacy of his playing in so many passages. Nowhere is that more true than in that magical passage (7:09-8:55) where the piano, supported first by the clarinets and then by hushed strings, leads us back to the cello solo. Kim and the Hallé are marvelous here. Mind you, Gilels and the Berlin Philharmonic set the bar so high in this episode that it’s nearly out of reach. So rapt, so full of innigkeit is the playing in this passage that the listener scarcely dares breathe. Interestingly, Hough and Wigglesworth adopt a more flowing tempo than either of the other versions. Perhaps they take more literally the Andante marking? In their hands the movement becomes more of a lied and I very much like their way with the music. That said, a more expansive, inward performance such as one hears from Kim and, even more so from Gilels, is even more to my taste. The Rondo finale has a cheerful countenance and the Kim/Elder performance is extremely enjoyable. That said, all three of our pianists are highly successful in this movement. I enjoyed the Kim/Elder performance of this concerto and I think it’s just as fine an achievement as their reading of the First. So, where does all this leave us? I don’t think my allegiance to the very different performances of either concerto by either Hough or Gilels has been broken. And there are many other very fine versions of both works in the catalogue. However, Sunwook Kim is a formidable contender and his partnership with Sir Mark Elder is extraordinarily successful. If you buy these discs I don’t think you’ll be at all disappointed. I’m sure I shall be returning to these performances and not just for pleasure; they will make challenging comparators for future recordings of either of these pinnacles of the piano concerto repertoire. There is, however, the grubby question of price. Kim offers no coupling and this pair of discs is currently priced at around £19. Hough similarly offers only the concertos but Hyperion offer their pair of CDs at a two-for-one price of around £12. DG have the Gilels recordings in their series ‘The Originals’ and offer the two-disc set at a similar price to Hyperion but add the not inconsiderable bonus of the Fantasien, Op 116. You pays your money…..